Over the weekend, DMX held a show in Newark, N.J., at the New Jersey Performing Arts Center, but a man is also claiming that he was held up at a gas station in the city by DMX and his friends. According to police, a 21-year-old man is alleging that he briefly encountered DMX and his entourage at the gas station. Although the conversation began as a friendly talk discussing music, the unnamed man was then held at gunpoint and robbed of $3,200. "The two had a brief conversation about rap music, and during the conversation a male in DMX's entourage showed the victim a gun and demanded the victim's money," said Newark police spokesman Sgt. Ronald Glover. 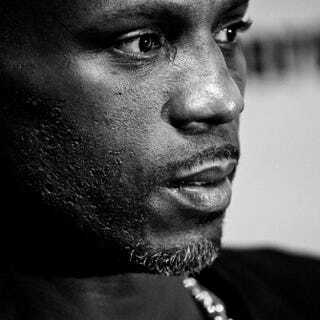 The victim says that DMX snatched the money out of his hands and fled in one of four Escalades that were part of DMX’s entourage. According to Glover, the victim followed the Escalades onto a Newark highway and was able to jot down a license plate. Although no arrests have been made, Newark police are in the early stages of their investigation.